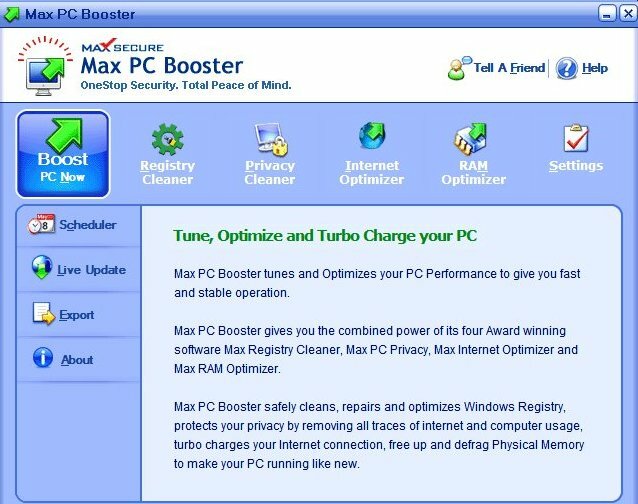 Max PC Booster tunes and optimizes the performance of your computer to give you fast and stable handling. Max PC Booster gives you the combined power of its four award-winning programs: Max Registry Cleaner, Max PC Privacy, Max Internet Optimizer and Max RAM Optimizer for the price of one program. Max PC Booster safely cleans, repairs and optimizes the registry of Windows, protects your privacy by removing all traces of internet and computer activities, accelerates your Internet connection, free and defragment physical memory to your computer is always functioned as new. Remove errors from the registry and causes your computer to function as a new one.